In an interview with Tadias Magazine, Danny Mekonnen, the group’s Ethiopian-American founder, agreed with NPR’s description, yet also pointed out that even he finds it difficult to explain the music. “It’s funny now that I am talking to the press more and more I am asking myself the same question”, Danny told TADIAS. “What is it?,” he said, admitting that he is not sure how he would categorize Debo’s music genre. Debo’s debut album features originals, such as DC Flower and Habesha, the latter based on the Diaspora experience where a young man is mesmerized by an attractive East African woman walking down the street that could be either Ethiopian or Eritrean, while the former is an instrumental giving prominence to Embilta flutes and traditional drums. 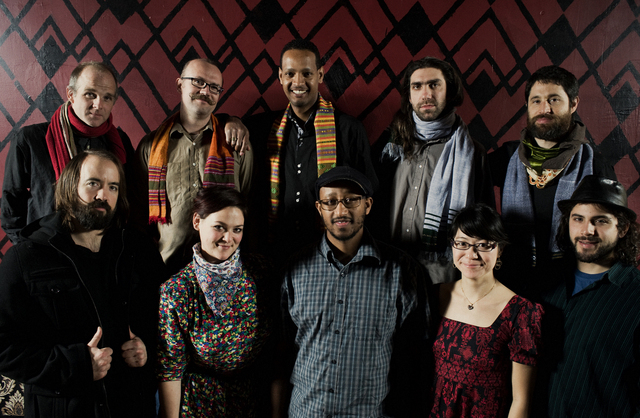 “The two songs are noteworthy because we are carving our space as a Diaspora, Ethiopian-American band,” Danny said. Danny said his friend Charles Sutton, Jr. – the Peace Corps volunteer who in 1969 arranged for Orchestra Ethiopia, then led by Tesfaye Lemma, to tour the United States under the name “The Blue Nile Group” – was also instrumental in helping him to connect with older Ethiopian musicians in the U.S. “Charlie arranged for me a private lesson with Melaku Gelaw, one of the top washint and kirar players of that generation,” Danny said. According to Danny, Mr. Sutton was also responsible for suggesting the name “Debo” as the group’s identity. “I told Charlie I was searching for a band name and he spoke to an Ethiopian lady friend of his and she came up with the word,” Danny shared. “Ethiopians tell me that it sounds like Dabo (bread),” Danny said laughing. Debo Band is getting ready for their CD release tour starting next week and will be performing at The Bell House in Brooklyn, the U Street Music Hall in Washington D.C. as well as at the renowned Philadelphia Folk Festival in Schwenksville, PA. For a detailed listing of their upcoming tour please visit Debo Band’s website. You can learn more about Debo’s new album and pre-order at www.subpop.com.